The XLR is one of the most common connections in professional analog and digital audio and lighting controls. Most commonly used is the 3 pin configuration; it is available in 3 to 7 pins. Typical uses are 3 pin for audio and lighting, 5 pin for lighting, 4-6 pins for power supply connections. On the standard 3 pin the pinout is pin 1 ground/shield, pin 2 high, and pin 3 low. Most cables use a male on one end and a female on the other end making it easy to daisy chain cables. For audio the male connector is typically the output or sending connector. The XLR is the best typical connection. It has pins so unlike the 1/4" connector they do not short or contact the other contacts on insertion or extraction, plus they are enclosed in its housing for protection. Most are latching so you don't have to worry about them being disconnected, forming a very solid reliable connection. Here at EHS we offer our custom cables with these XLR connectors: 3-pin standard straight, Gold, Right Angle, Gold Right Angle, female switched (silver and gold) and 5-pin standard for lighting control. The switched XLR is intended for use on a microphone without a switch so it can be turned on and off. We can customize anything you might need even if you don't see it on the site. All XLRs (except switched) are available with an optional colored boot (see options info page), black is standard. XLR to any other connector, Y cables, etc. The TRS 1/4" connector is also one of the most common connectors in pro audio. Its uses include line level signal, insert in/out, head phones, instruments (infrequently) and more. It has 3 contacts: Tip, Ring, Sleeve (thus TRS), the tip being high or left, ring being low or right and the sleeve being ground/shield. Most TRS cables have male connectors and panels have female connectors. Because most cables only have male connectors you need an adapter to daisy chain or extend a cable. Because the cable has the same connector on both sides it doesn't matter which way you run it, although since also both ins and outs on a panel use the female connector you do have to be watchful which you hook up to. The TRS is a less reliable and more troublesome connector than most. With the exposed contacts it leaves greater possibility for grime from handling, they have a tendency to pop on insertion or extraction because you can cross contact the contacts and short them and the jacks have a higher failure rate due to wear and dirt. With all that said, they are still great connectors, but if you have a choice between XLR and 1/4" I would recommend XLR. Here at EHS we offer our custom cables with these TRS 1/4" connectors: standard straight, gold, right angle, gold right angle, and female inline. We can customize anything you might need even if you don't see it on the site. All TRS are available with an optional colored boot (see option info page), black is standard. TRS to any other connector, Y cables, etc. 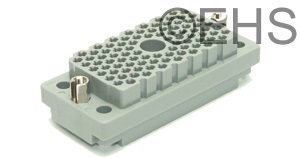 This is a fairly uncommon connector and can be called by several names like Phoenix (which is a brand), Euro (there are other connectors called this too), Pluggable terminal block, and probably more. These come in many sizes and configurations from 2 to 16 pins, and have screw terminals to connect the wires. These are often used on gear intended for permanent installation. In audio applications Euro connectors are typically 3 pin connectors allowing connection of high, low, and ground. They make a good reliable connection between connectors, although sometimes the wires can be pulled out of the connector (I wish someone made a solder version). At EHS we stock what seems to be the most common size, though if you order these on one of our cables we'll often request from you what they are connecting, to make sure they are the correct size. Since gear that uses these often comes with them, we can also use your connectors to build the cable if you send them to us, just contact us for details. We can customize anything you might need even if you don't see it on the site. This is a fairly common connector in consumer audio and video lines and somewhat in pro lines. It is most commonly used as a headphone connector but also as a microphone connector on cameras. It is very similar to the 1/4" connector just a smaller size. It has 3 contacts: Tip, Ring, Sleeve (thus TRS), the tip being high or left, ring being low or right and the sleeve being ground/shield. Most cables have male connectors and panels have female connectors. Because most cables only have male connectors you need an adapter to daisy chain or extend a cable. Because the cable has the same connector on both sides it doesn't matter which way you run it, although since also both ins and outs on a panel use the female connector you do have to be watchful which you hook up to. The TRS is a less reliable and more troublesome connector than most. With the exposed contacts it leaves greater possibility for grime from handling, they have a tendency to pop on insertion or extraction because you can cross contact the contacts and short them and the jacks have a higher failure rate due to wear and dirt. With all that said, they are still great connectors. Here at EHS we offer our custom cables with these TRS 1/8" connectors: gold straight, nickel right angle, gold right angle, and gold female. We can customize anything you might need even if you don't see it on the site. The XLR Mini connector is often used in microphone connections, often a lapel mic to a body pack. The two main configurations used are 3 pin and 4 pin. Typically it is the female connector found on a cable end and you almost never see a male to female cable. The XLR Mini is a fairly reliable connection and is latching like its big brother. 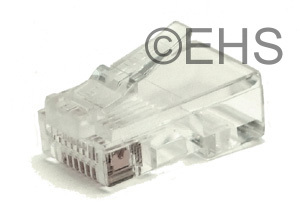 Here at EHS we stock 3 and 4 pin female connectors (TA3FL and TA4FL). The most typical request is for adapter cables. We can customize anything you might need even if you don't see it on the site. 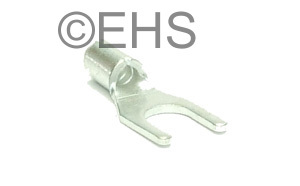 The Fork Terminal is for use on screw terminals or barrier strips. The screw terminals/barrier strips are common on older gear and gear for permanent installation. The fork terminal is for easy connecting to the terminals. These form a very solid and reliable connection, although it does not allow quick tool-free wiring changes. Here at EHS we use high grade lugs and solder them on for long term reliability. The TT connector is similar to the 1/4" connector, but smaller in diameter and shorter in length. It is primarily used on patch systems in studios and live sound. It has 3 contact points, Tip, Ring, Sleeve (TRS), the tip being high or left, ring being low or right and the sleeve being ground/shield. The TT is a very solid connection that will provide years of trouble free use when quality products are used. The TT patch bay is far superior to 1/4" patch bays and often worth the extra cost in the long term. 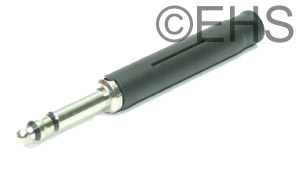 Here a EHS we offer TT connectors with Mogami 2552 wire in our specialty cables. We can custom make any snake or other cable with them but due to the lack of demand we don't have them on the site. The TS 1/4" connector is also one of the most common connectors in pro audio. Its uses include line level signal, instruments and more. It has 2 contacts, Tip and Sleeve (thus TS), the tip being high, and the sleeve being ground/shield. Most TS cables have male connectors and panels have female connectors. Because most cables only have male connectors you need an adapter to daisy chain or extend a cable. Because the cable has the same connector on both sides it doesn't matter which way you run it, although since also both ins and outs on a panel use the female connector you do have to be watchful which you hook up to. The TS is a less reliable and more troublesome connector than most. With the exposed contacts it leaves greater possibility for grime from handling, they have a tendency to pop on insertion or extraction because you can cross contact the contacts and short them and the jacks have a higher failure rate due to wear and dirt. With all that said, they are still great connectors they can just be a little more trouble. 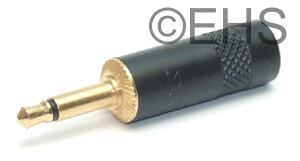 Here at EHS we offer our custom cables with these TS 1/4" connectors: standard straight, gold, right angle, gold right angle, gold silent, gold silent right angle and female inline. The silent connector is used typically on instruments and shorts the contacts when unplugged to prevent popping the amp or PA. We can customize anything you might need even if you don't see it on the site. All TS are available with an optional colored boot (see option info page), black is standard. TS to any other connector, Y cables, etc. This is a fairly uncommon connector in consumer audio and video lines and pro lines. Its most common uses are control voltage in/out, contact closures, and IR controllers. It is very similar to the 1/4" connector just a smaller size. It has 2 contacts, Tip and Sleeve (thus TS), the tip being high, and the sleeve being ground/shield. Here at EHS we offer our custom cables with these, we stock black and gold TS 1/8" but do not have them listed on the site due to lack of demand. We can customize anything you might need even if you don't see it on the site. The RCA is probably the absolute most common connector in audio and video. It is used for line level audio (typically -10dbv consumer level), video (composite or component), and Digital SPDIF. It has 2 connecting areas, a center pin for the signal and an outer ring for the ground. Most RCA cables have male connectors and panels have female connectors. Because most cables only have male connectors you need an adapter to daisy chain or extend a cable. Because the cable has the same connector on both sides it doesn't matter which way you run it, although since also both ins and outs on a panel use the female connector you do have to be watchful which you hook up to. When quality components are used the RCA is a very good connection. They lack a latch, but often good connectors will seat tight enough to not need it. They have a tendency to pop when plugged in so care must be taken to protect gear. Here at EHS we offer our custom cables with these RCA connectors: gold straight connectors in 10 colors, gold right angle and gold female. We can customize anything you might need even if you don't see it on the site. RCA to any other connector, Y cables, etc. The list below contains some of the connectors have been listed prior, although some of the information has been rewritten to be more specific to data/video connectors. The RJ-45 connector is a very common connector used in network and phone applications. Sometimes referred to as a CAT-5 connector, Ethernet connector, etc. (As I Google to see if there is any other pertinent information I might be forgetting I see that the RJ-45 I use might not really be an RJ-45 but actually a 8P8C connector, but everyone and my vendors call it an RJ-45 so we'll stick with that). It is an 8 pole connector with a latch. It is of relatively low durability, the biggest problem being the latch that can break off easily if bent backwards. When everything is in good condition it makes a good solid connection, though as jacks age they can be problems. This is an add on to the RJ-45 connector, it is an XLR-connector-sized housing that the RJ-45 fits into offering a protective metal shell, a replaced latch, and a cable grip and strain relief. These must be matched with the EtherCON panel connector to use. An EtherCON panel connector will accept a standard cable and the EtherCON but a standard panel connector will only accept a standard cable. These are very nice additions to a CAT-5 cable especially when used in the field in a live sound or studio environment. I just wish more manufacturers would start using it on their gear so that we can use it on our cables. Here at EHS we offer/stock the NE8MC-B-1 black housing which uses the standard XLR boot, so you have 10 colors options. We can customize anything you might need even if you don't see it on the site. The RCA in digital and video is typically used for a 75 ohm connection of SPDIF digital audio, composite video, or component video. It has 2 connecting areas, a center pin for the signal and an outer ring for the ground. Here at EHS we offer custom cables with these RCA connectors: gold straight connectors in 10 colors, gold right angle and gold female. We can customize anything you might need even if you don't see it on the site. The BNC is typically used for clock and video applications as a 75 ohm connection. It is similar to the RCA in connection and often used for the same type of signals, although for clock and video applications it is a higher quality connection. It has 2 connecting areas, a center pin for the signal and an outer ring that spins and works as a latching mechanism for the ground. Most BNC cables have male connectors and panels have female connectors. Because most cables only have male connectors you need an adapter to daisy chain or extend a cable. Because the cable has the same connector on both sides it doesn't matter which way you run it, although since also both ins and outs on a panel use the female connector you do have to be watchful which you hook up to. 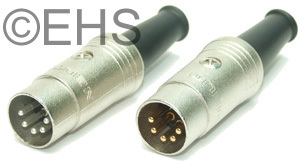 Here at EHS we offer custom cables with two styles of BNC: a soldered connector that has gold contacts used for Mogami and Horizon and a compression connector used for RG-6. The MIDI connector refers to the 5-pin DIN connector with 180 degree pin span. There are 9 connector pin arrangements (at least common ones) ranging from 2 to 8 pins with 2 5-pin connectors that have 180 degree and 240 degree pin spans. As stated earlier it has 5 pins though for most applications only 3 are used. 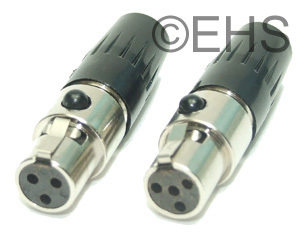 We use the best available MIDI connector; they are durable and fairly solid. I consider them to be fine quality, although I wish someone made a better one (one built more like a Neutrik XLR connector with a cable chuck and a larger boot). Most MIDI cables have male connectors and panels have female connectors. Because most cables only have male connectors you need an adapter to daisy chain or extend a cable. Because the cable has the same connector on both sides it doesn't matter which way you run it, although since also both ins and outs on a panel use the female connector you do have to be watchful which you hook up to. Here at EHS we offer custom cables with these MIDI connectors: Neutrik (Rean) connectors NYS322 silver pins and NYS322G gold pins, both with nickel housing. The XLR is one of the most common connections in professional analog and digital audio and lighting controls. Mainly used is the 3 pin configuration; it is available in 3 to 7 pins. Typical uses for 3 pin is audio and lighting, for 5 pin is lighting, and for 4 to 6 pins is power supply connections. On the standard 3 pin configuration the pinout is pin 1 ground/shield, pin 2 high, and pin 3 low. Most cables use a male on one end and a female on the other end making it easy to daisy chain cables. In AES the male connector is the output (sending connector) and in DMX the female is the output (sending connector). The XLR is the best typical connection. They are locking so you don't have to worry about them being pulled apart, forming a very solid reliable connection. Here at EHS we offer our custom cables with these XLR connectors for 3-pin: standard straight, Gold, Right Angle, Gold Right Angle, female switched (silver and gold); and for 5 pin we offer: 5-pin standard for lighting control. We can customize anything you might need even if you don't see it on the site. All XLRs are available with an optional colored boot (see options info page), black is standard. The TS 1/4" connector for speakers is one of the most common speaker connectors in pro audio. It has 2 contacts: Tip and Sleeve (thus TS), the tip being positive (red), and the sleeve being negative (black). The TS is a less reliable and more troublesome connector than most. With the exposed contacts it leaves greater possibility for grime from handling, they have a tendency to pop on insertion or extraction because you can cross contact the contacts and short them and the jacks have a higher failure rate due to wear and dirt. With all that said, they are still great connectors, they can just be a little more trouble. This is the same TS connector used for line level and instrument cables except the housing for speaker cables is bigger and heavier duty to support the larger speaker cable. Here at EHS we offer our custom speaker cables with these TS 1/4" connectors: nickel and gold in all jumbo, mid sized and large straight and large right angle. We can customize anything you might need even if you don't see it on the site. The Banana connector is probably the greatest and simplest speaker connector. It offers a large contact area for high power demand, and usually a fairly solid connection. A banana connector is a one contact connection, though there are dual banana connectors that contain 2 contacts. They offer a quick connect/disconnect method, and if you are using a dual banana they are moderately safe from shorting out. The dual banana is typically the safest pick to protect equipment from shorts, though some amps and speakers have a wider spacing on the jacks so that you must use split banana connectors. The dual connectors have a 3/4" (.75") spacing center to center. Here at EHS we offer our custom cables with these banana connectors: single gold, dual nickel with black housing, dual nickel with red housing, and dual gold. We can customize anything you might need even if you don't see it on the sight. The Spade lug or fork is for special applications typically involving really high current or very large wire. Often used when a banana connector is not available, it offers similar contact benefits to bananas. While it is slower to connect and disconnect, it is also almost impossible to accidentally disconnect a properly terminated connection. 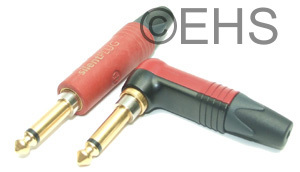 Here at EHS we stock and offer our custom cables with top quality gold heavy duty lugs. There are many styles of screw terminals, so we can also terminate cables with special lugs as needed. We can customize anything you might need even if you don't see it on the sight. The Speakon is one of the most convenient and safest speaker connectors around. It comes in 2, 4, and 8 poles (contacts), has a latch to prevent accidental disconnect and has a cable clamp to help prevent the cable from being pulled out of the connector. Its contacts are completely enclosed and the connector is keyed to be mated only one way making it almost impossible to cause a short and damage an amp even when hot swapping. The majority of gear uses the 4 pole connector. Most Seakon cables have female connectors and panels have male connectors. Because most cables only have female connectors you need an adapter to daisy chain or extend a cable. Because the cable has the same connector on both sides it doesn't matter which way you run it. Here at EHS we stock the most commonly needed Speakon connectors. We can customize anything you might need even if you don't see it on the site. The EP/AP connector is a pin style speaker connector, it is sort of like a large XLR looking connector. It is not a very common connector, often used on older high end cabinets and touring cabinets. Pinouts and configurations vary by manufacture so if you need a cable we'll often need to confirm what is being connected. EP and AP are compatible connectors EP being a heavy duty metal connector and AP being a plastic housing connector. At EHS we keep a very small stock the most commonly need connectors, if it is time critical please check with us before ordering. We can customize anything you might need even if you don't see it on the site. The D-Sub is a very common connector. For audio typically we are using the 25 pin connector, referred to as a DB-25, D-subminiature, and D-sub 25pin. You might also see the 15 pin for some less common layouts. The standard 25 pin in audio is used for an 8 channel balanced analog, 8 line AES/EBU, and TDIF. Other signals are sometimes done but are uncommon. For the analog connection it is normally one standard pinout, which I've heard called the "Tascam pinout", the "Mackie Pinout", etc. It is used for both in or out, and sometimes in and out on the same connector. For use as a digital connection with AES/EBU it gets much more complicated. There are several major pinouts used by major manufacturers. Often it is used as 4 lines in and 4 lines out, but then is complicated by things like 8 channel A/D converters that just have 4 lines out. TDIF seems to be a dying format, it has a standard pinout that as far as we can tell everyone uses. Here at EHS we offer our custom cables with a large selection of D-sub options. We have the most common options on the site and are working to list more, although there are so many possible ways to build a D-sub snake we will never be able to cover them all on the site. We can customize anything you might need even if you don't see it on the site. The DL is a ZIF (zero insertion force) connector. These are slowly becoming a very uncommon connector. It comes in a variety of connector sizes, 96 pin being one of the more common. These are often found on Analog SSL (Solid State Logic) consoles and some analog cue systems, and built custom for machine rooms in studios. It is typically a black connector with an actuating handle that turns about 90 degrees to connect the pins and latch down. Here at EHS we stock a small stash of these for our studio clients; we don't currently have any offered on the site, but if you need something please contact us. The ELCO (aka EDAC) connector comes in five pinouts of 20, 38, 56, 90 and 120, so it can support up to 40 channels of balanced analog signal. These are more common that the DL connector but their use is dwindling too. These are often found on (perhaps older) Neve, Amek, Soundcraft and other consoles. Also used on some gear and in machine rooms for studios. It is typically a gray or green connector with a gray metal hood. They are defined as either having a "screw" or a "nut". If it has a screw, it will have a knob or handle in the center back of the connector hood that is used to mate and seat the connectors together. Because the pins fit so tight together, often a fully or nearly fully loaded connector will require the force of the screw to completely seat the connectors together. A properly constructed ELCO in good condition forms a very good connection that is very reliable. Here at EHS we offer our custom snakes with an optional ELCO disconnect, which is great to disconnect a mixer from the stage snake for quick setup and tear down. We can customize an ELCO for anything but because there are so many options it is best to contact us for information. There is a endless variety of other multi-pin connectors out there, we have listed the ones we most commonly use. If you have interest in a different type of connector please contact us to discuss options.